The County Clerk of Johnson County, J. G. Rudy of Olathe, writes Governor Joshua Bailey, of Topeka, regarding the Johnson County Commission's efforts to aid victims of the Kansas River flood. 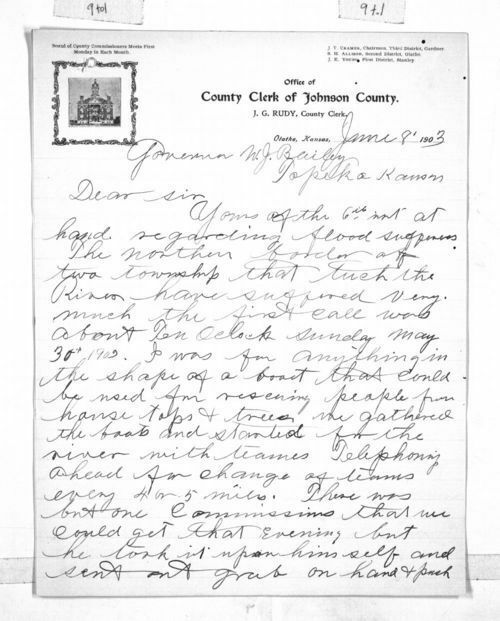 The letter describes the townships most affected by the flood and initial rescue efforts by boat. Mr. Rudy discusses efforts to distribute provisions, including actions taken by the County Commission and the Atchison, Topeka & Santa Fe Railroad Company.